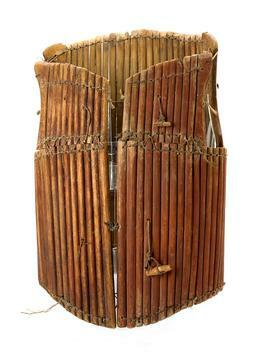 This armor vest, made of tightly bound wooden rods, was for protection against arrows and darts. It was taken from an Unangan burial cave, along with other kinds of objects that were placed with the mummified dead for their use in the afterlife. Aron Crowell: This came from a mummy cave, a burial cave. Mary Bourdukofsky: For a burial. If someone dies, you put that in there. They used to put all their belongings in there. Daria Dirks: I wonder if they sized it to themselves, to their own bodies. Vlass Shabolin: Yes, probably an individually made one. You make your own, and then you go to war. Mary Bourdukofsky: Just like machinery, [how someone] made it [slats] the same size, so intelligent whoever [made it]. Vlass Shabolin: Mm-hmm. Especially when they size the wood and cut it up like that. They probably didn’t even have a saw. They probably used some sharp rock to shape it up. Daria Dirks: What kind of work do you think that [binding] is? Mary Bourdukofsky: To me, it’s a twine. It’s not sinew. It’s one of the Russian-made things. Aron Crowell: Do you have any thoughts about those people from long ago. I mean, you’re really kind of looking at a part of their lives when you see something like this. Daria Dirks: It just reinforces my belief that they really were intelligent people, and they are very strong for everything that they have been through. We’ve been through a lot from both the Russian and American government, and we’re survivors. We’ve been here, and we’re still here. The intelligence and the strength of them just amazes me when I see this. Mary Bourdukofsky: They made their own tools and they did beautiful job on what they did. Daria Dirks: And they knew which plant is poisonous to put on the arrows and to get the whales and so forth. They’re just amazing, the fact that our men and women didn’t go to college or school, and they could make items like this. And that the women were also doctors, they knew how to do mummification and so forth. And now I’m having a hard time trying to convince our younger people to go to school, to go to medical school. Mary Bourdukofsky: Like midwives, they know all about that. Mary Bourdukofsky: And another thing I heard, my dad said that Aleuts taught themselves how to cure [people]. And if somebody died, they wrapped them up like a mummy. A long time ago—no matter [if it was a] child, woman or man that died—they did it. Every one of them, they mummified them. And they had to look and see what caused them to die. They studied them, certain men did that, teaching themselves. They took all of the insides out, and they studied it. They looked at the insides and figured out what was the cause of the death. And before they buried them, they stuffed them up with grass and moss and then wrapped them up. Before they had cloth, they used grass mats, burial grass mats. They put their legs up, then they tied them up to make the body short. And ladies started making burial masks for them. That’s how they did it, he said. Maria Turnpaugh: I thought they were in sitting position. Mary Bourdukofsky: They could sit them like that, but their legs are up to here [hips]. Aron Crowell: You heard this from your father? Mary Bourdukofsky: My grandfather told my father, and my father told us. They taught themselves, like a doctor. For people who had a headache, my dad said they used to do something in the neck and drain them. They call it amg^achug^o [letting blood drain from the neck to relieve high blood pressure] in Aleut. They sterilized a needle over a candle and let it cool off, then poked them in the main vein I guess and let the blood drip. They did that couple of times or so and that person who had trouble with headaches said their headaches used to go away. Aron Crowell: Who did the mummification process? Mary Bourdukofsky: It was the shaman with his helper, who studied like a doctor. And then whenever somebody was sick, he went there and predicted what was wrong and gave him certain homemade medicines. Shamans knew things that were going to happen and how to help the sick. They lived in the village, and they kept to themselves. Daria Dirks: Did shamans marry? Mary Bourdukofsky: Not that I know of, he never mentioned them being married or have family. Maria Turnpaugh: The Aleuts they were sea captains, they were doctors, they were everything before the Russians came. Aron Crowell: What do people say about the history, about when the Russians came and how life changed when that happened, stories that Elders have told? Mary Bourdukofsky: Well, my dad used to say they thought that life would be much, much better if the Americans took over. But he said it wasn’t much different than how the Russians treat them. They were still put aside and things like that. Mary Bourdukofsky: Mistreated. And sometimes, they didn’t treat them as human beings. I used to ask, “Why? Why they do that to you? To the people of the Pribilof and Aleutian chain?” He said, “Well, I can’t very well tell you or know much about it. Maybe we’re a little darker than them.” And one thing he told us too, they had to do what they were told or else they were punished, even the grown-ups, just like they were little children. Vlass Shabolin: Yes, they didn’t have any say so. The Russians governed us to where actually we were slaves to the Russians. That’s when they took the men and forced them to do everything they wanted with the fur seal and the otter and the walrus. The Russians stayed and built something like headquarters for themselves out of driftwood. And the Aleuts stayed in the sod houses, in the group. Aron Crowell: This is one of the objects that is part of your repatriation requests, along with the shield. Daria, would you like talk about repatriation and about what’s going on? Daria Dirks: Allison Young-McClain is working on that with Dorothy Lippert, because I had asked if we could get a female and young child’s remains back. Alison said there was a process where they have to work together, all of us from our region, and that there’s different requests from all over the United States. So we’re going to have to wait to get our remains back, probably a couple of years, she said. Aron Crowell: Could you talk about the importance of repatriation, why your village is undertaking that? Daria Dirks: We want them to bring the remains home so that they can be at peace, to be brought home to the Islands, where they belong, and to bury them at peace, instead of being in a drawer or storeroom. Aron Crowell: Is that something that people have talked about in your community? Mary Bourdukofsky: Yes. I went to a meeting about finding the remains in that cave way out in Nikolski. They took those remains that were in the cave back and made a little coffin for them, and then they had a regular burial service for them in the Orthodox Church and buried them at the same cemetery where all the Orthodox Christians were buried. So if we get those—what she’s talking about—I’m pretty sure they’ll do the same thing. Aron Crowell: What if pieces like this come back, where would they go? Would they go into a museum out in the Aleutians? Daria Dirks: Yes, I’m sure that the Museum of the Aleutians can handle it. But I’d still like to bring this to the Pribilofs for viewing when the [new] building is done. This complete armor vest is constructed of smooth, red-painted rods, sinew bindings, flat carved pieces at the armholes, and wooden toggles for closure in the front.